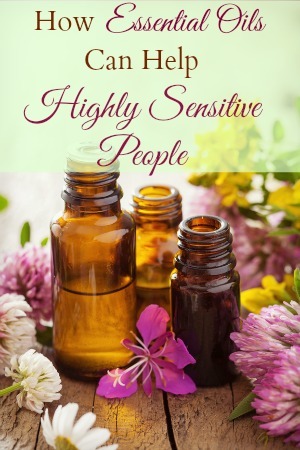 The main difference between a highly sensitive person and a non-highly sensitive person, though, is degree. 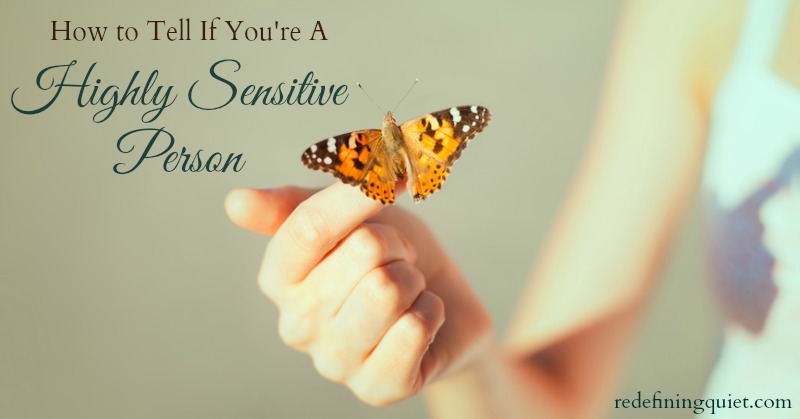 Somebody who is highly sensitive will be affected by things much more quickly and easily than somebody who isn’t highly sensitive, and the HSP will also be bothered by subtler things that a non-HSP might not notice at first. So, if an HSP and a non-HSP were together at an event with crowds of people, loud music, and bright lights, chances are that the HSP will be the first to feel overwhelmed by it all while the non-HSP might still be having a great time. Highly senstive people are often the first to notice (and also the first to be bothered by) things like a dripping faucet, the glare from a lightbulb that’s too bright, the chilly draft from the air conditioning vent, or the overly-strong scent of the air freshener somebody sprayed in the office at work. Depth of processing. Do you find that you tend to think about things at a deep level? Do you often take a long time to make decisions because you are mulling over all of the different possibilities? Do you usually observe and reflect first before acting? Would you describe yourself as cautious and conscientious because you aware of (and have thought a lot about) the consequences of what might happen? Overstimulated Easily. 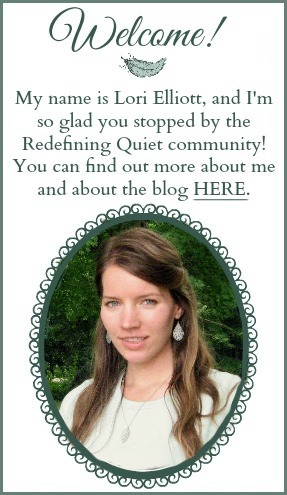 Do you tend to feel stressed and overwhelmed when you’re in a noisy place or a chaotic environment? Do deadlines or time limits make you feel rushed and stressed? Do you prefer quiet and peaceful environments at work and at home? Do you find that you need a lot of downtime, especially when you’re in an overstimulating environment? Emotionally reactive. Do you tend to be empathetic and find it fairly easy to see things from another’s perspective and feel what they are feeling? Are you affected strongly by the moods and emotions of the people around you? Do you feel things deeply? Sensitive to subtle stimuli. Do you notice little details that others might not (or notice them sooner than others do)? Do you find yourself often needing to adjust things slightly in order to be more comfortable – things like dimming the light a bit, turning the volume down one notch, turning the heat or air conditioning slightly up or down? Do you notice small changes, like something that has been moved or an object that is out-of-place? 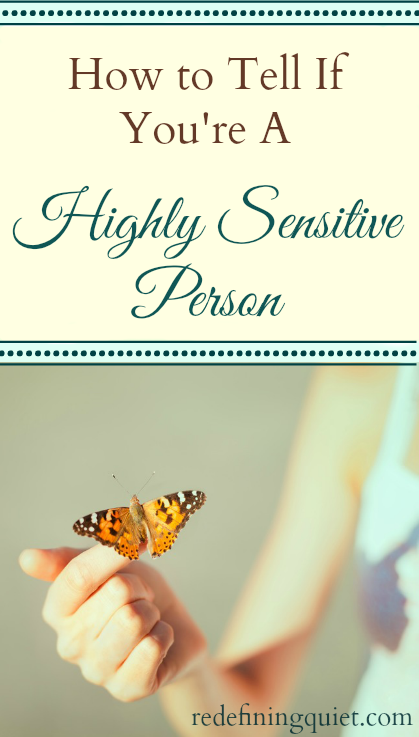 Not every single highly sensitive person will have all of these characteristics to the same degree, of course, but in general these four traits are helpful to differentiate HSPs from non-HSPs. 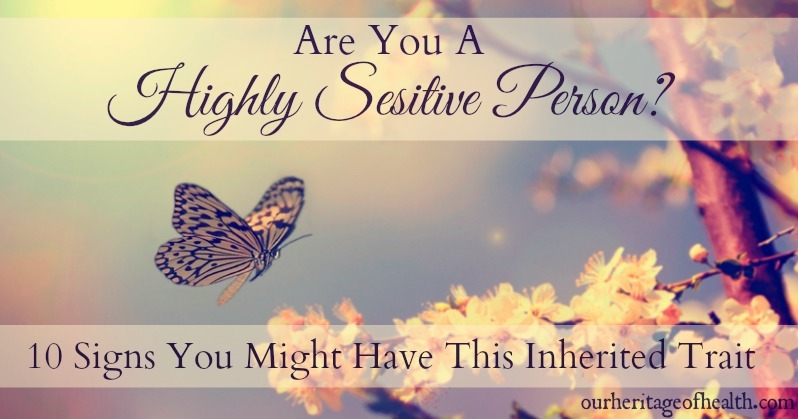 I’ve written another post about HSPs on my other blog, Our Heritage of Health, with 10 more ways to tell if you have the trait of high sensitivity. Some of the 10 ways are similar to some of the ones I mentioned above, but it might be helpful to see them described in a slightly different way.